The boots just arrived via FedEx. They look great and fit perfectly. I really appreciate all your help. The service was awesome. I will be back with you in the fall for a black pair just like them. I have a family and friends who rodeo and will be referring them to your site. Feel free to use this as an endorsement for Lonestar boots. 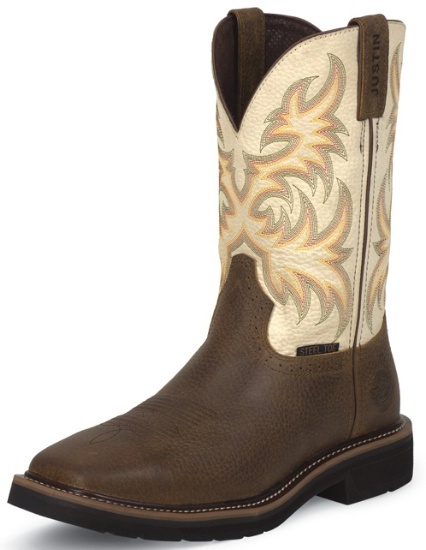 Justin Men's Stampede Work boot in Copper Kettle Rowdy Leather Foot and 11 Inch Titanium White Leather Top featuring a J -Flex Comfort System Insole for all day comfort. This boot also features a Stampede Square Steel Toe with Block Unit Work Heel and Stampede Rubber and EVA Combination Outsole for long wear. Whether out on the town or working on the ranch, you won't go wrong with the purchase of this fine Justin product. Justin Boot Company, makers of fine quality western boots and shoes since 1879. Get your boots from Lonestar boots where the owner has over 25 years of boot experience and is willing to get you the best price possible.